SHANGHAI, Oct. 12, 2018 /PRNewswire/ -- Bilibili, the leading online entertainment platform for young generations in China, today announced that it has signed a strategic partnership with the Houston Rockets NBA basketball organization to expand its presence in the eSports sector. Bilibili's eSports team, Bilibili Gaming (BLG), and the Houston Rockets' eSports team, Clutch Gaming (CG), had their first friendly game on October 9, 2018, followed by a similar friendly encounter between the Shanghai Bilibili Sharks and the Houston Rockets on October 10, 2018. 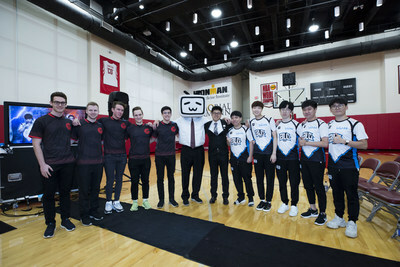 Houston Rockets chief executive Mr.Tad Brown said, "As a very important component of the Houston Rockets organization and its brand, the CG team is honored to form this partnership and engage in friendly games with Bilibili's eSports team. The partnership is groundbreaking." 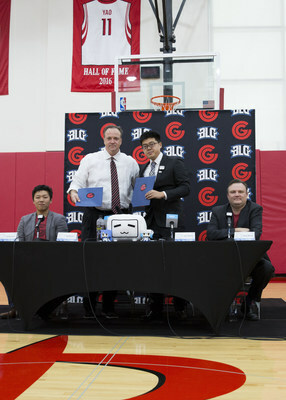 Mr. Sebastian Park, vice president of Houston Rockets eSports, stated at the press conference held to commemorate the signing of the partnership that, under terms of the agreement, Bilibili will become the official partner of CG. In addition to annual friendly basketball competitions between the Shanghai Bilibili Sharks and the Houston Rockets, the two parties' eSports teams, BLG and CG, will also compete in friendly games concurrently. In addition, the CG team will broadcast their games in real time on the Bilibili platform and interact with their fans. Mr. Shengyan Zhang, senior director of Bilibili, said at the press conference, "The annual friendly games between the Shanghai Bilibili Sharks and the Hoston Rockets have already become an established tradition over many years. Consequently, we are now extending the friendly relations to the eSports sector to promote our cooperation and integration of the two sports fields." The growing popularity of eSports worldwide is inevitable. According to a report on the sector issued by market research organization Newzoo, the global eSports market grew 103% from 2015 to 2017. Both emerging internet companies and leading players in traditional industries are seeking opportunities in the eSports market. Bilibili has become an important player in the sector. Bilibili formally formed its own eSports club, BLG, in December 2017. The League of Legends team representing Bilibili participated in the League of Legends Pro League (LPL), placing 5th on the scoreboard in the spring competition. The team also garnered 2nd place at the Demacia Cup. Meanwhile, Bilibili secured live and on-demand broadcasting rights for the 2018 LPL, the Global Final and several intercontinental tournaments. On September 7, 2018, Blizzard Entertainment Inc., announced that Bilibili was granted a permanent seat at the Overwatch League (OWL), with the team settling in the city of Hangzhou as its home base. Alongside Tencent, Bilibili is one of the two companies in China that is active in gaming, live broadcasts, eSports and basketball. Most notably, Bilibili earned its slot in the top competitions, such as LPL and OWL in less than a year. In the traditional sports industry, it has become a trend for NBA teams to collaborate with eSports counterparts. As eSports competitions are gradually forming their own system that increasingly follows the structure of traditional sports competitions, basketball teams that are household names, including the Houston Rockets, are looking forward to integrating their operational experience with eSports clubs. The Rockets formally established their eSports division in December 2016, and it was officially licensed to participate in the League of Legends' LCS North American competition with its CG team in October 2017. On the heels of its cooperation in the eSports sector, Bilibili plans to further expand its eSports brand globally, while the Rockets plan to expand their eSports business further into China, a huge market with a massive number of players. Commenting on the cooperation, Ms. Ni Li, vice chairman and COO of Bilibili, said, "The collaboration with internationally influential clubs, such as the Houston Rockets, will help Bilibili form a mature business model for sports club operations. We look forward to accelerating the integration between eSports and traditional sports through our well-established friendly relations and promoting communication and development between the sports industries in Shanghai and Houston."